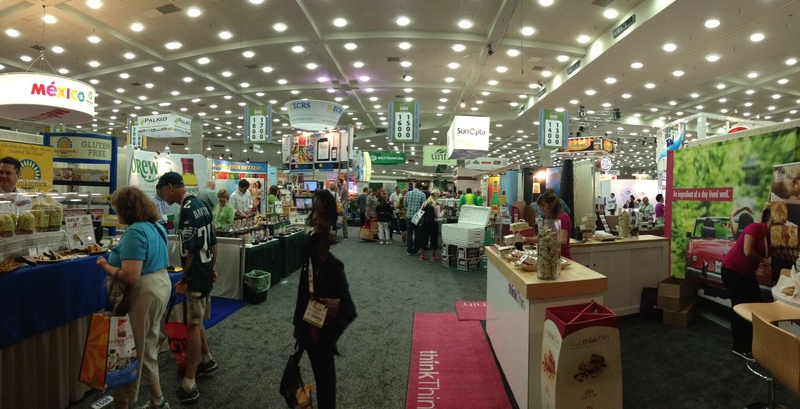 If you haven’t been to either Natural Products Expo East or West yet, it’s a must attend for good-for-you-foodies as well as those looking for products that take an environmentally friendly approach to consumerism. B’More Organic – When I heard “organic skyr smoothie” my skepticism kicked into high gear. Then I was told it was ideal for those, like my brother, who are lactose intolerant. Sure, I thought. Then I tried their Mango Banana Skyr Smoothie. Stunningly good, loaded with protein and good for you. I took a bottle for the road-trip home. Conti Gourmet Coffee – I can’t say enough good things. Roberto “The Coffee Man” serves a great cup of coffee, keeping me fueled for the entire show. I’m ruined for Starbucks from here on out. Epic – This was the biggest surprise for me at Expo East. Epic’s 100 percent grass-fed, animal-based protein bar caused me some hesitation. However, at the urging of others, I tried the Bison bar and was remarkably surprised at how good it tasted. I’ll be ordering a box this week. Gelato Fiasco – This group from Maine was a lot of fun. We talked a little about social media, and a lot about their awesome gelato. While they are primarily in New England right now, I fully expect to see them on a store shelf here in Pennsylvania area soon. They are definitely worth stopping for the next time you are in Massachusetts or Vermont. Late July Organic Snacks – Celebrating 10 years in the organic, non-Genetically Modified Organisms (GMO) snack space, this established player still has the power to surprise with its new a tangy and impressive new Sub-Lime Multigrain Snack Chip. I’ll be looking for this one in my local grocery store. NoTatoes – This super-young start-up made quite a big buzz at Expo East with delicious Cassava Tortilla Chips. Keep an eye on this company. I have no doubt you’ll be seeing them in a lot more stores soon. Sibu Sura – A micro-batch chocolate producer out of Maryland (using 100 percent organic and fair trade cacao beans from Peru), Sibu Sura not only offers some of the best chocolate from Expo East (I tried just about all of the chocolate available), but their mission of social good and environmental friendly packaging make them a distinctive standout in any crowd, including at Expo East. Suzanne’s Kitchen – Amazing pepper jelly. I’m a connoisseur of sorts where pepper jelly is concerned. I once drove to Virginia because I heard a company there did a good job with pepper jelly and I wanted to verify it. By far, Suzanne’s is the best I’ve ever tried. I picked up a jar of Pepper Jelly Heaven from my local Whole Foods on Sunday night to snack on while watching the finale of Breaking Bad. Wild Poppy Juice Company – I gave up soda and fruit drinks almost 20 years ago, but this organic craft fruit drink – which offers just a hint of soda-esque texture – made me think I was missing something amazing. The Organic Peppermint Lemonade was a surprising discovery, and one worthy of singling out as a Best of Show from Expo East. There are so many others worthy of a mention, but only so much you’ll want to read on your tablet or smartphone. Be sure to check out our video round-up (posting shortly) of other impressive stand-outs from Expo East.